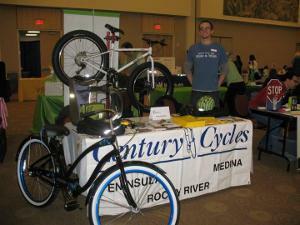 Century Cycles Blog: Is your company having a wellness fair? Many companies are helping to improve the well-being of their employees by organizing employee wellness fairs. These events provide valuable information for employees about topics ranging from exercise and nutrition to physical therapy and mental health. During the past year, Century Cycles has participated in wellness fairs at local companies such as Cliffs Natural Resources, United Airlines, Cleveland State University (below), and Parma Hospital. We would be happy to talk to your employees about the health benefits of bicycling, as well as provide information about our products, bike rentals, repair services, and events. If you are part of a human resources or employee wellness department, and you'd like to talk to us about participating in your company's next wellness event, please feel free to contact our Marketing/Events Coordinator Tracey Bradnan at tracey@centurycycles.com.